C.K. Lee’s book, Against the Law: Labor Protests in China’s Rustbelt and Sunbelt , is a very important contribution to the sociology of contemporary China. The field needs this kind of innovative and theoretically adept work. And one of the great strengths of the research is the fact that it takes the Chinese context seriously in a profound way; it is “China-centered” sociology. This stands in opposition to work that brings a theoretical perspective (often inspired by European experiences and theorists) and then attempts to “apply” the theory to the data of Chinese experience. C.K. does not make this mistake. The book is a major empirical and theoretical contribution to the effort to better understand current social realities in China. But it is also an important and innovative example of how to use sociological theories more generally to arrive at a sociology of urban 21st-century society and social change. 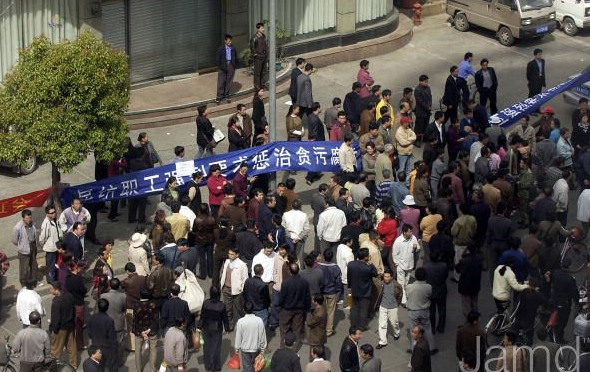 The book looks at the rising incidence of labor protests in post-reform China. Abrupt and profound social changes are occurring that have had a great impact on the condition of working people: privatization, dissolution of state safety net, new export factory system with labor supplied by rural immigrants. C.K. looks at two regions and two “situations”: Rustbelt (Liaoning in the northeast, where protests are stimulated by the loss of employment, unemployment benefits, medical care, unpaid pensions) and Sunbelt (Guangdong in the south, where protests are stimulated by discrimination, exploitation, and horrendous working conditions). These are conditions that Anita Chan documents in China’s Workers Under Assault: The Exploitation of Labor in a Globalizing Economy. Towards the end of the book C.K. summarizes the two locales as representing “The death of socialism and the birth of capitalism” or words to that effect. The title is important: “Against the Law” captures both the central theme of protest – workers appealing to agencies and the central state for their legal rights – but also to the insurgent and often repressed status of their protests. C.K. is interested in exploring the sociology of these labor worlds in an appropriately “local” way: what are the specific features of the Chinese economy, Chinese production, Chinese policy and law, and Chinese culture that produce two rather different patterns of protest and contention in two segments of the Chinese manufacturing economy? Lee emphasizes the contingency of these developments and their dependency on rather proximate causal / social factors. She believes that the nature of the mobilizations and protests is affected by the way in which they are framed. Writing about Rustbelt protest: “My main concern … is to analyze how the characteristics and limits of worker protests are linked to the mode of state regulation of labor and the social reproduction of labor power” (71). Elsewhere she makes the point that Sunbelt protests have less mobilizational “staying power” because of the living situation of migrant workers: they return to their villages in times of distress, and their movement collapses. She distinguishes sub-types of Rustbelt protests by their underlying issue: nonpayment protests, neighborhood protests, bankruptcy protests. In other words, rather specific circumstances that set the context for life and work in the two regions and sectors have substantial effects on the nature of dissent and protest that results. She also highlights the nuance and heterogeneity of the social realities she studies. “What strikes an outside observer as a homogeneous group confronting common economic predicaments growing out of structural reform is experienced from within the group as fragmented interests, unequal treatment, and mutual suspicion” (84). So she doesn’t make the mistake of assuming homogeneity of “workers” or other social categories. So a particular strength of her approach is that it emphasizes the contingency, variation, and internal heterogeneity in social processes that we should expect. “Theory” is a help but not a blueprint. A substantive and important point that C.K. arrives at is the “cellular” nature of labor protest in China today. She refers almost all of these protests as “cellular” – meaning they lack a larger regional base of organization. Also they are fairly spontaneous; not much local organization or planning is needed or provided. This cellularity derives from specific features of the social environments in which labor protests emerge in China today. “A confluence of institutional factors produce the prevailing pattern of cellular activism. State work units provide the physical sites of communication and coordination, organize workers’ interests, and define the boundary of the aggrieved community” (112). But state surveillance and repression prevents the incubation of organizations – such as independent labor unions – that might convey local activism to a broader regional level. A second substantive point – perhaps her most fundamental point, and the inspiration for the title of the book – is the unusually central role that appeals to legal rights play in current examples of labor protest. Kevin O’Brien refers to this strategy as “rightful resistance” (Rightful Resistance in Rural China ). C. K. makes the point clearly at the end of the book: “The centrality of the law and legalism is salient, and is perhaps a unique Chinese way of popular contention, triggered by the regime’s decentralized legal authoritarianism. Even without formal or conscious cross-class alliance against the state, the common and ferocious charge of ‘against the law’ is a powerful and haunting chorus to the Chinese regime” (261). A third important characteristic of C. K.’s analysis is her insistence on the agency and subjectivity of the workers whose actions she considers. She pays attention to their consciousness and ideas and their need for self-respect and dignity – these all play important roles in the movements and activism she describes. She insists on seeing workers as agents, not victims: “Like the making of class, we cannot predict the outcome but can explain the trajectory of when and which ideological interpellation underlies what collective action” (122). And she emphasizes the “moral indignation” aspect of many protests. “I seek to understand the indigenous meanings, relations, and institutional context that come packaged with these terms when they are invoked in the rustbelt, often simultaneously” (114). This means that it is a sociologically important area of research, to attempt to provide a deeper understanding of the consciousness of the men and women who make up this history. I am also appreciative of the methods of investigation and research that Lee uses. She makes skillful use of her sophisticated understanding of various relevant pieces of sociological theory and analysis; her deep and expert knowledge of the chronology of legal reforms and policy shifts that have affected industry and labor in China since 1980; and an expert command of the macro-level economic and political data that are available about industrial change and labor unrest. But these forms of theoretical and empirical knowledge constitute a foundation for a more qualitative kind of research: careful case studies of particular factories and disturbances based on her own fieldwork, along with interviews of participants that bring the book into the range of a kind of industrial ethnography. In other words, the arguments of the book are situated within a strong theoretical and empirical understanding, and are moved forward through synthesis of many of her own observations and interviews with participants. This combination gives the book a particularly acute flexibility when it comes to understanding the complexities of the social situations in Guangdong and Liaoning. Her analysis of the two situations is not merely an expression of her underlying theories; rather, it is a sensitive “portrait” of the nuanced series of developments that are found in the two regions.